The course was developed to take an in-depth look at community organizing through a gender and equity lens. Workshops held throughout the week focused on the various barriers women and marginalized groups face at work and how forming a union can help overcome these challenges. During the week-long session, participants developed their organizing skills through a series of exercises designed to build confidence when explaining labour rights to workers seeking to bring a union to their workplace. “Through this course, we took a peek into the history of union women and how critical our sisters were in making a huge difference,” says UFCW 401 member Samantha Fortin. “Not only that but how much more important our voices are now when we stand together as a voice for women in a new era where we still battle much of the same issues as our grandmothers did. We as women feel and experience the world in a different way that is unique to our ability to constructively help others that have experienced similar issues in their lives,” Sister Fortin adds. Facilitated by the UFCW Canada National Office, the course also equips activists with organizing strategies that incorporate inclusive approaches and perspectives to help overcome equity barriers. 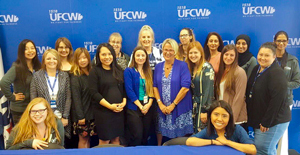 “With women making up the majority of UFCW Canada’s membership, a course like this allows participants to take a glimpse at the important work UFCW does in political and union organizing,” says UFCW Canada National Representative Zenee Maceda. “In doing so, we continue to build a strong membership who take equity seriously in their labour activism,” she adds. To learn more about UFCW Canada’s advocacy for women, visit www.ufcw.ca/women.